Silicon Valley Bank’s annual industry survey has been summarized by Lewis Perdue’s Wine Industry Insight, and while I don’t have a link (it came late yesterday via email), I’d like to make it the focus of today’s post. 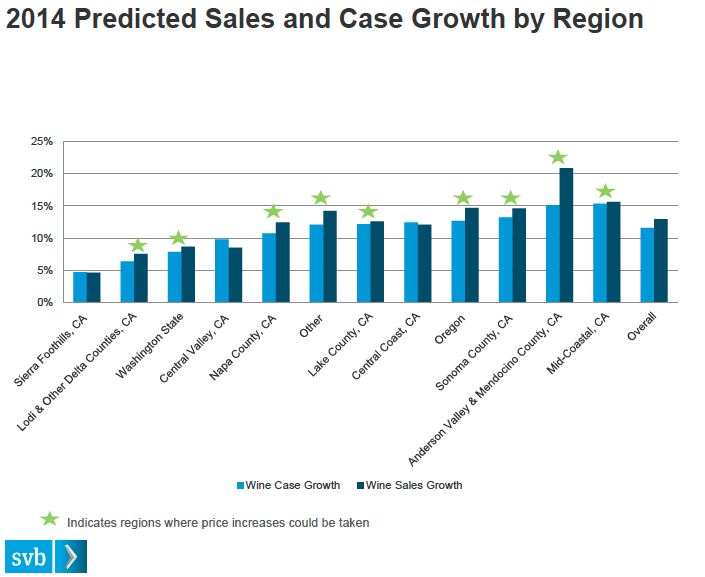 The most interesting part is SVB’s “predicted sales and case growth by region.” I did manage to drag the chart onto my desktop, and reproduce it here. It’s kind of small: sorry about that. 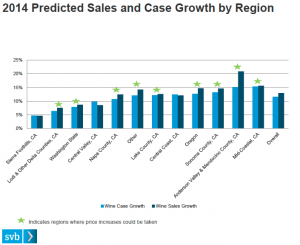 As you can (or cannot) see, the chart takes nine California regions and predicts their case growth and sales growth for this year. The regions with the least growth are the Sierra Foothills, Lodi, the Central Valley and, surprisingly, Napa County (in that order, from least upward). The region with the highest growth by far is Anderson Valley/Mendocino County. Mid-Coastal (Santa Cruz/Monterey)) also is projected to have high growth, as are Sonoma County, Lake County and the Central Coast (San Luis Obispo/Santa Barbara). I don’t find any of this in the least surprising. It’s actually quite interesting, because it’s always interesting to see a bird’s eye view of these large regions and compare and contrast them with one another. I’m delighted that Anderson Valley is doing so well. It’s a small region, but so impressive, especially for Pinot Noir and the Alsatian varieties. Someone described Anderson Valley Pinot to me as a cross between Santa Cruz Mountains and Oregon, and I think that’s about right. Mid-Coastal is a term I hadn’t heard before regarding Santa Cruz/Monterey; generally, I think of those as Central Coast. Santa Cruz isn’t a very big wine-producing county, although it is of high quality. Too bad all those vineyards in the Santa Clara Valley are now housing developments and Silicon Valley companies! But Monterey is a very high-production place, and as we’ve seen for some time now, it’s also coming up in quality. I’m not talking just about its best-known AVA, the Santa Lucia Highlands, but the county as a whole. Prices also have remained reasonable, which surely is one of the most important reasons why Monterey is doing so well. People are looking for a bargain, and they get it with Monterey wine. I said Napa County was one of the places with the least predicted growth, but that’s a little misleading. It’s on the lower side compared to the higher-growth regions, but not by much. The point, I think, is that sales there are limited by the high prices. We can argue about whether they’re warranted another time; for now, suffice it to say that American consumers, post-Great Recession, seem to be looking for value, and Napa doesn’t really represent value, any more than, say, Classified Growth Bordeaux represents value, unless you’re willing to say that a 95-point Cabernet that costs $150 is a “value.” I mean no disrespect to Napa Cab, only to suggest that it is a little too pricy for most people, and that’s what seems to be holding back Napa’s sales growth. Sonoma County on the other hand is doing well, and I think that’s because their prices just haven’t kept up with Napa’s. We all know that Sonoma County, with its many appellations, is far more diversified than Napa, or for that matter than just about any other major wine-producing region in the world, in terms of the varietal range. And quality, too, is really high. But the Sonomans have never been able to charge Napa-esque prices, which is to our (the consumer’s) benefit. Then there’s Central Coast, defined as Santa Barbara (mostly) and San Luis Obispo. Santa Barbara has been one of my top wine regions for more years than I care to remember. I was championing it early, and the reason I can say that is because Santa Barbara vintners were telling me, a long time ago, that I “got” their region, while other critics didn’t, in their view. I don’t know about that, but I do know that Santa Barbara, with its various AVAs (Santa Ynez Valley, Santa Rita Hills, Santa Maria Valley) caught my fancy in the early 1990s, and whenever a Santa Barbara winemaker told me that other critics never visited there, I always was astonished. Santa Barbara’s a funny place, price-wise. The best wines are expensive, but, again compared to Napa Valley, not really. And there are quite a number of fabulous wines, across varieties ranging from Pinot Noir and Chardonnay to Cabernet Sauvignon, Merlot, Sauvignon Blanc, Viognier, Syrah and Grenache, that haven’t leapfrogged into the too-expensive category…yet. I think Santa Barbara prices are heavily connected to the economy, but they’re still reasonable, which explains why the region is experiencing growth. I won’t say anything about the low-growth regions here. I wish them luck. Anyhow, as you read this, we northern Californians are hunkering down for the Great Storm of ’14. Good luck to us, and to you. It’s a slow news day, it’s been a long week, so you’ll have to cut me some slack here with this rather tongue-in-cheek post that actually does contain a kernel of observational sanity. An online news site, Uncover California, has a story today that claims “Many people believe the promising wine region of the Valle de Guadalupe in Baja California, Mexico, has the potential to become ‘the next Napa Valley’…”. Finally, “Is the North Fork the Next Napa Valley?” asks Hamptons, an online zine. Some of this is crass promotional over-zeal. Some of it may actually be believed by the people claiming it. But it’s an interesting angle on the hold that Napa Valley has on our collective imagination. Sorry to end the fun, kids, but there won’t be a “next Napa Valley.” The time is gone when an American wine region can leap to the top of the charts and fire everybody up. That train left the station in the 1990s and isn’t coming back. The public is too smart to fall again for such an anointing by the media, especially the wine media, whom it doesn’t much trust these days. I’ve been watching developments for the last few months concerning these new .wine and .vin Internet domain names. Not closely, just sort of casually. I knew there was some controversy about them, but I wanted to keep an open mind, and besides, who has the time nowadays to research every complicated issue of social, economic or technological policy? So it was that yesterday’s big article (by my old friend Chris Rauber) in the San Francisco Business Times really grabbed my attention. “Noted wine regions, including Napa and Sonoma, protest new .wine Internet domain names,” the headline screamed. In addition to the Napa Valley Vintners and Sonoma County Vintners, those opposed to the proposed domain names include the Paso Robles Wine Country Alliance, the Santa Barbara County Vintners’ Association and—in other states—the Willamette Valley Wineries Association, the Walla Walla Wine Alliance, and even the Long Island Wine Council. Pretty impressive lineup. These are power players. I know the California regional associations quite well from my many years of rubbing elbows with them; with the power of their member wineries behind them, they possess clout. And they’ve been joined in their opposition by some powerful Congressional representatives: Mike Thompson (one of the senior Democrats in the House) and Anna Eshoo. I can’t remember a time when so many regional associations joined forces publicly in opposition (or in support of, for that matter) a pending issue. So I figured I ought to look a little more deeply into what’s going on. At first blush it makes sense to carve out .wine and/or .vin domain names. We all know the Internet is running out of domains and has been for years. Two years ago, ICANN, in response to the problem, announced it would accept applications for additional domain names. It got nearly 2,000, many of them contested. ICANN decided to auction off the non-trademarked domain names to the highest bidders; the first auction was a year ago, and brought in over $9 million, through the sale of such domains as .club, .college and .luxury. So what’s the problem with .wine and/or .vin? After all, even the U.S. government approves of the auction plan, which, after all, is an expression of classic free market principles. Last March, an agency of the Commerce Department declared that “ICANN is uniquely positioned…to develop the transition plan” toward a new set of domain names. Although the department urged ICANN “to convene global stakeholders to develop a proposal” for the transition—an encouragement to compromise and conciliation—the wine associations aren’t buying it. These are serious and legitimate concerns. Nobody wants to see a situation wherein some for-profit wine company buys the rights to, say, “napacabernet.wine”, thus misrepresenting itself and its association with venerable Napa Valley. Napa “has had our name ripped off” before, the Napa Vintners spokesman said (most of us remember when and by whom that was!) and isn’t about to let it happen again. You’d think that ICANN and other legal entities could address the concerns of those opposed by building in rights and protections for stakeholders, and that’s exactly what ICANN has proposed to do. They’ve created a “Legal Rights Objections (LRO)” mechanism by which disputes can be resolved when someone objects to “a third party’s application for a new TLD [top-level domain].” Negotiation is more or less normal operating procedure in our era of contention and litigiousness, but the wine region associations remain unconvinced, and certainly they have a point when they fear they’ll be forced to spend a whole lot of money, either on lawyers or on buying back the rights to names they want. This is a sticky one, and I have to admit I’m not sure which side I come down on. What do you think? Should .wine and .vin be up for sale to the highest bidder? It’s gratifying to see such a well-written and informative article about Sonoma County written for a Chinese audience (albeit an English-speaking one?). We hear often about a certain naivete when it comes to Chinese comprehension of California wine; they are supposed to know the Big Names, and Napa Valley, of course, but in the conventional wisdom, the Chinese are woefully ignorant of the rest of California. That may have been true in the past, and may still be the case among millions of Chinese emerging into the upper-middle classes. But McKirdy’s article proves that the level of journalism provided to Chinese wine lovers is on a rapid upward trajectory. If you’re reading this blog, chances are you know that Sonoma is not exactly an “emerging” premium wine region; it emerged some time ago. But these things are relative; it depends on your knowledge base. One person’s local wines are another’s emerging discoveries. I Googled “emerging wine regions” and got interesting hits. From askmen, which seems to be an online pub for all things guy, I got this list: England, Brazil, Canada, Greece, Romania, Ukraine and Switzerland. A few years ago, another online pub, Food Republic, published this list of emerging wine regions: Istria (Croatia), Guerouanne (Morocco), Virginia, Montevideo (Uruguay) and Sopron (Hungary). I like the regional specificity. The International Business Times wrote an article called “Beyond Napa: The Best Emerging Wine Regions in America,” and on their list are Walla Walla, the Texas Hill Country, Traverse City (Michigan), Loudoun County (Virginia) and the North Fork of Long Island. That also is a very interesting list. I’d love to do comprehensive tastings of these regions, if only I had the time! Are there any emerging wine regions in California? I don’t think so. We know which appellations do the best, which provide good value, etc. I don’t see anything out there just waiting to be discovered. Anyway, it’s wonderful that so many countries in the world are tinkering with wine. It’s also wonderful that consumers are getting interested in them, and writers are writing about them. The world is rapidly shrinking, which is good news and scary news: scary for wineries, because competition, already fierce, is only getting fiercer. The 2012 California Grape Acreage Report is hot off the presses and the most noteworthy fact is that white winegrape acreage is down from 2011 while red winegrape acreage is up, but just barely: a mere 274 acres, about a tenth of one percent over 2011. 1. White winegrape varieties have remained fairly constant in acreage for twenty years because growers know that consumers are buying pretty much as much white wine as they’re capable of. So why have the last ten years seen a virtual moratorium on new plantings? It’s puzzling. Maybe a closer look at the data will give some answers. Of the red varieties, all of the following are down in acreage, since either last year or since 2003: Zinfandel, Merlot, Grenache and Barbera. This suggests that growers believe these varieties don’t have a future (although individual wineries, of course, will continue to specialize in them). These varieties are up since 2003: Cabernet Sauvignon (+12%), Petite Sirah (+103%), Pinot Noir (+89%) and Syrah (+27%). These are the varieties growers feel are likely to increase in consumption. The only major white variety that significantly increased in acreage over the last ten years is–you guessed it–Pinot Gris. It’s up 380%, although the starting point was low. Pinot Gris now has 12,473 acres planted in the state, and is poised to overtake Sauvignon Blanc (14,911 acres, and dropping) as the #3 most widely-planted white variety, after Chardonnay and (sigh) lowly French Columbard. The inescapable conclusion is that California growers are conservative. They plant what has been selling and what they believe will sell. Of course, the public doesn’t necessarily listen to growers; consumers, always a step ahead of the experts, drink what they want. Growers didn’t see Moscato coming, which is why plantings of the various Muscat varieties in California shot up from 2011 to 2012. Nor did growers see Pinot Noir coming before 2004’s Sideways. After that phenomenon, they planted it ferociously. Still, there’s no escaping the fact that California continues to be basically a chocolate-vanilla-strawberry state when it comes to red and white wine. And that’s a situation unlikely to change anytime soon.